I was rehearsing with a string quartet for something, and found myself talking to the violist about strings: I had been trying out a lot of different brands and types of bass strings at the time. I figured that it had to be done sooner or later – and damn the expense – so for a while I spent quite a lot of money on strings. As it happened, none of them achieved what I was seeking because I was looking for something that the instrument I was playing at the time couldn’t deliver. Anyway, I told him about a conversation I had recently had with a mutual friend, a highly-esteemed (and highly-strung) violinist. This fiddler had commended my quest: when I said I hadn’t yet found a string that satisfied me, he said “maybe it’s not important – what’s important is that you’re searching”. In contemporary music you are often either playing buckets of tiny notes in irregular groupings or else endless long held notes. A feast or a famine. Modern composers frequently skip the chapter on orchestration – actually they often skip the whole manual – which makes for great fun meeting the challenges. And if you return to the early eighteenth century you also find that the upper and lower parts have roughly equal complexity, Baroque counterpoint featuring the continuo just as much as the melody. This is great repertoire for the bass-clef-ist. But the most popular music tends to observe a kind of inverted pyramid structure, where the lower parts have the fewest notes and the upper ones the most. This is true of most Romantic music as well as pop, rock and jazz. The bassist here is primarily providing an architectural foundation while the violin/synthesiser/guitar/saxophone does all the cornicing and filagree and stained glass. 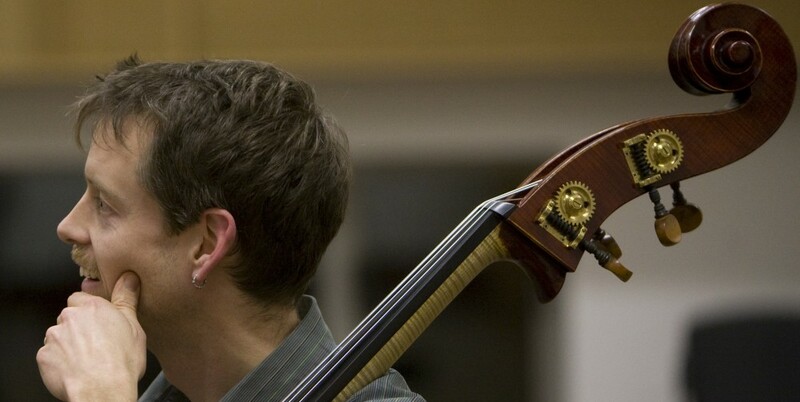 I was playing the Schubert Octet a few years ago – a work of the inverted pyramid genus – and the first violinist made a lovely observation: he said that it must be great to be a bassist and to be able to care for every note. This is truly a thing for the double-bassist to cherish. We have a role that is all about support and doesn’t attract much popular attention, but the possibility of examining and developing a single tone is a real blessing. Less is more, and while those stratosphere-dwellers are dealing in contours, we often have the time to love a note. Any bassist who doesn’t dig a pedal point is in the wrong job. Robert Palmer’s 1986 song Addicted to Love was played of the radio as I was driving the other day. It was framed by two other 80’s pop-rock songs which were neither better nor worse, and very similar in sound (dominated by drums and fuzz guitar). The vocals are pretty humdrum, certainly not special in any way. The video – as enjoyed by my teenage self – was of course running in my head, which made it stand out from its neighbours. I reviewed the video on youTube later and with the sound off, it’s really quite lousy – the models are gorgeous of course but there’s nothing to it, they mime appallingly (apparently the musician hired to coach them gave up and left after an hour) and Palmer himself looks like a slightly self-conscious history teacher on a bad hair day. It looks pretty cheap. Neither song nor video are memorable, but the combination is a multiple of the sum of its parts and deservedly a classic. The success of this song/video combo is like the magic of a rock band with just 3 chords and an idea who manage to speak profoundly to a listener. Or that of a classical quartet of four distinct individuals (all with their inevitable shortcomings) which becomes a musical entity entirely beyond their individual limits. A nice analogy is the way in which acoustic instruments played in close proximity will add to each other’s resonance when played perfectly in tune. Had Palmer’s song been more remarkable, this video would not have fit, and they would not have had the same cumulative effect. More than the sum of its parts is of course what every artistic endeavour should aim for as a minimum. But for this to happen, the parts must be in tune. I always joked that the real career of a bassist was not playing the thing but transporting it. One needs a sense of humour to maintain an occupation which requires the daily porterage of what may be the largest object a human is expected regularly to carry. In the case of a busy freelancer, you may have the thing in and out of the car six times a day (if you are on public transport the onus is much more onerous). Last week I made a six-hour round trip to rehearse in Cork for three hours. The only bit that was employment was the three – because I am a professional musician not a driver – and this is not unusual. If you have the constitution to treat travel as relaxation then you can consider a freelance musical career. In the same vein I always wondered if the bass was the one in charge… after all, it gets what it wants, doing what it was made to do. The bass is only involved in the music, being cosseted in transit. I would like to be the bass, carried everywhere with great attention to my comfort and safety. There is a word for this: phoresy is a symbiotic (non-parasitic) relationship in which a more mobile organism transports another of a different species. The bass can’t move so I move it. Furthermore, the bass will outlive me because I take such good care of it. But I get plenty out of this too, it is after all both a livelihood and an artistic pursuit. In the case of a wooden passenger the word could be phorestry? Which would make me a phorester, engaged in the lifelong nurture of a sort of strange, itinerant, composite, hollow tree. People are impressed by a display of technique, but what is more impressive of course is when technique is not displayed. As a student I admired greatly the tense sinewy arms and fingers exhibited by many bassists and the furrowed brow and gritted teeth that went with a manly approach to bass-playing. In fact, aches and pains in limbs and back were badges of honour, as was having a lop-sided frame with misaligned hips and shoulders. Abrupt, mechanical shifts and a rigidly positioned left hand showed discipline and demonstrated your commitment to conquering this beast. It was easy to be impressed and to inadvertently emulate this approach. 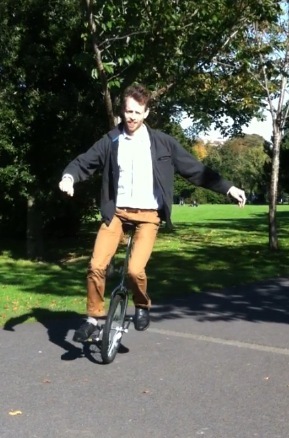 When I was little, my parents recall me pestering them for a unicycle. They didn’t know I was serious (neither did I, really) but when I came across the right one for me in a circus shop in France this summer, my wife didn’t try to dissuade me: she could see I was determined. So I got it – a shiny minimalist icon – and failed to get to grips with it at all. Dismantled and packed deep in the car, it would have to wait til I got home for some serious attention. Several youTube tutorials later, I began in earnest once the kids were back at school. I fell off a lot and faced the distressing possibility that I was too old (or just too uncoordinated) to get the hang of the thing. But within a few weeks I was trundling along merrily, my joy exponentially enhanced by its being the realisation of a lifelong ambition. What I didn’t expect was that it would be so physically and psychologically beneficial. It seems to me to be a discipline very much along the lines of Pilates and Feldenkrais. The abdominal muscles are engaged, the back straight and the hips aligned. It requires fully intuitive and dynamic balance involving every part of the body. Feldenkrais’ method aims to “make the impossible possible, the possible easy, and the easy elegant”: this describes perfectly the business of learning to unicycle and could usefully be adopted as a motto for life. Or, put another way, riding a unicycle is a guide to successful living. Today I began a project with two ICO string colleagues and a saxophonist, Cathal Roche. The setting is the age-related day hospital in Tallaght, and Ian Wilson is composing for the group a piece inspired by his meetings with staff and patients of the dementia unit. (This follows from a fantastic 2010 project in the stroke unit which resulted in a CD called Bewitched.) We played the first movement of it, and it was great. But first we played a bunch of stuff from the random gig folder, a lot of it baroque. The soprano sax instantly became a cornetto, almost precisely! Curiously, I had a similar thought in the opposite direction when playing late-Beethoven with a period band (historical instruments). The classical bassoon in its highest register is a fabulous, raucous sound like a saxophone letting rip. When we hear these things played on modern instruments, the effect is much less extreme. It can be hard to do justice to the composer’s ideas when your (modern) instrument and technique make things easier than intended! The bassoon at the beginning of the Rite of Spring; the bass solo in Mahler 1. The objective of playing the written notes as well as possible doesn’t necessarily align with the objective of playing the music right. The music is not on the page, as any saxophone player will tell you.